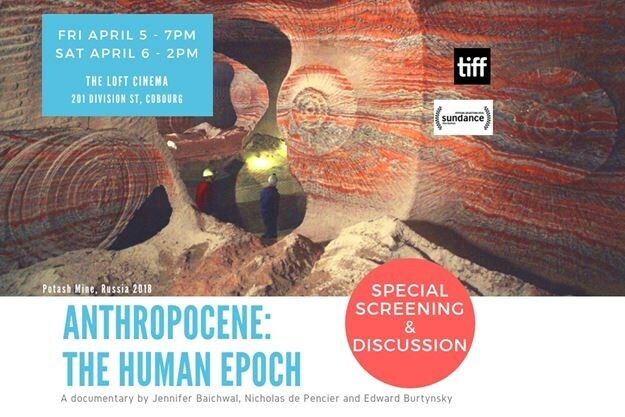 A film screen and discussion will be held at the Loft Cinema on April 5 at 7 p.m., and April 6 at 2 p.m.
Anthropocene: The Human Epoch is the third collaboration for awarding-winning photographer Edward Burtynsky and acclaimed filmmakers Jennifer Baichwal and Nicholas de Pencier. The event is being hosted by Blue Dot Northumberland, Council of Canadians Northumberland Chapter, Sustainable Cobourg and the Loft Cinema. The April 5 evening screening will be followed by a discussion with local energy-systems and sustainability expert Ralph Torrie. Coproducer Nicholas de Pencier will host a Q&A after the matinee on April 6, to discuss how global issues affect us here at home. Tickets are $12. Purchase at Victoria Hall Box Office, Cobourg or online at www.concerthallatvictoriahall.com, 905-372-2210.